I remember once making a deposit at the bank and the teller asking what I did for a living after seeing “veterinary allergy” on the deposit slip. She then asked me about pet food. When I mentioned a particular manufacturer, she commented, “Doesn’t ____ kill dogs?” This is what we’re up against! We need to educate our clients about diets, and in particular, those used to diagnose food allergy in dogs and cats. The incidence of food allergy in dogs is unknown,1 although reported to be anywhere from 14 to 33 per cent.2, 3 Food allergy can develop at any age, but one study of allergic dogs indicated 33 per cent start at less than one year.4 (Interestingly, that’s true for humans, too.) There is no breed predilection in dogs, but West Highland terriers, German shepherds, boxers, Rhodesian ridgebacks, shar pei, Labrador retrievers, and pugs may be predisposed. 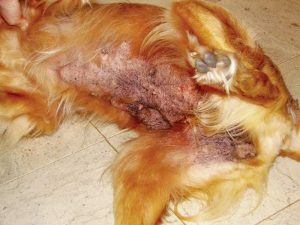 The patient history is one of non-seasonal symptoms, with a variable response to steroids, and may include dermatologic and/or gastrointestinal symptoms (in up to 50 per cent of dogs). Dermatologic symptoms include involvement of facial, feet, axillary, and/or perineal areas, otitis externa (sometimes unilateral), recurrent bacterial or yeast pyoderma, and pruritus. Skin lesions can often vary from papules, erythema, excoriations, hyperpigmentation if chronic, and/or seborrhea. Unusual manifestations include seizures in 10 per cent of dogs,5 erythema multiforme, lupoid onychodystrophy, vasculitis, and pemphigus. Food allergy often has the same symptoms as atopy. In fact, they may occur at the same time, making it difficult to reach a diagnosis. Ten to 49 per cent of cats may experience food allergy, with the age of onset anywhere from six months to 12 years. One study found one third of Siamese or Siamese crosses have food allergy.6 Non-seasonal symptoms include pruritus, miliary dermatitis, head/neck involvement, otitis, eosinophilic granuloma complex lesions, or self-induced alopecia. Flea allergy, atopy, or lymphadenopathy may be present in up to 30 per cent of cats with food allergy. Gastrointestinal problems may be seen in up to 50 per cent of food-allergic cats, with gastrointestinal biopsies yielding lymphoplasmacytic +/- eosinophilic inflammation. This photo illustrates a food-allergic golden retriever with ventral lichenification, hyperpigmentation, and secondary Malassezia dermatitis. Determining a food allergy in pets is not easy, as there is no simple blood or skin test that can accurately make the diagnosis. Attempts have been made to develop serum tests for food-specific immunoglobulin E (IgE), but none of the assays so far accurately predict food allergy.7 Mueller et al8 found serum testing for foods showed an 80 per cent negative correlation versus only a 20 per cent positive correlation. The only reliable method to make the diagnosis of food allergy in a dog or cat is with an elimination diet and consequently challenging the pet with the previous diet resulting in a flare-up of symptoms. An elimination diet (also referred to as a hypoallergenic diet) is a commercial or home-cooked diet containing a novel protein (i.e. one the pet has never eaten) or protein hydrolysate and a carbohydrate source not fed previously. When a home-cooked diet is the preference, it should be formulated under the guidance of the veterinarian, as one study9 showed the majority of owner-devised recipes were not nutritionally complete. The diet should be fed eight to l0 weeks in dogs and four to six weeks in cats, with no other foods, treats, flavored supplements, bones, etc. As mentioned previously, selecting an elimination diet requires choosing a protein and carbohydrate source not fed previously to the pet. For food-allergic pets, ingredient exclusions are just as important as inclusions. Grain free is not hypoallergenic. food allergy in dogs and cats. Limited-ingredient over-the-counter (OTC) diets are not suitable as elimination diets, as they may possess contaminant proteins. Prescription novel protein diets (e.g. Blue Buffalo, Royal Canin, and Rayne) are enzyme-linked immunosorbent assay or polymerase chain reaction tested to be sure no contaminant proteins are present, which figures into their cost (owners are generally unaware of this testing). not list extraneous protein sources. Many prescription elimination diet manufacturers, such as Blue Buffalo, Royal Canin, and Rayne perform enzyme-linked immunosorbent assay (ELISA) or polymerase chain reaction (PCR) testing for contaminant proteins during and at the final product, while OTC limited-ingredient diets do not. 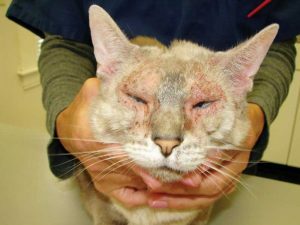 This cat has nonseasonal facial pruritus due to underlying food sensitivities. Unfortunately, it is often the case that clients decide they have ruled out food allergy because they feed a grain-free diet when, in fact, it is the protein source that is more commonly the allergen. Hypoallergenic and grain free are not interchangeable terms. Food additives are often blamed for allergies; however, there is little data to show colouring, preservatives, stabilizers, etc., are a factor. Prescription novel protein sources include venison, duck, rabbit, kangaroo, and most recently, alligator. An alligator-based diet (Blue Buffalo NP, Rayne Crocodilia-MAINT) is the most recent prescription hypoallergenic diet to emerge on the market. It is not that alligator is any less allergenic than other novel proteins, but rather, few OTC foods contain this protein, which means the pet has most likely not been exposed. 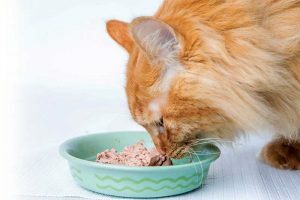 Hydrolyzed protein diets can also be used to diagnose and manage food-allergic pets. In these diets, the enzymatic hydrolysis of native proteins from chicken liver (Hill’s Z/D), poultry feathers (Royal Canin Ultamino), salmon (Blue Buffalo HF), or soybeans (Royal Canin HP, Purina HA) is used to reduce their allergenicity by cleavage of protein bonds, resulting in a <5KDa size.11 Purina HA is an 11KDa size protein hydrolysate. Small KDa size is important, as large peptides ultimately result in increased allergenicity. With hydrolyzed proteins, between 20 to 50 per cent of dogs eating partial hydrolysates derived from foods to which they are allergic will experience a flare-up of symptoms.12 Veterinarians have their own individual preference and comfort level when choosing between a novel protein diet and hydrolyzed diets. Truly novel protein sources are getting scarce and the degree of hydrolysis and level of purity in hydrolyzed diets are a concern. Finally, food-driven skin disease may be clinically indistinguishable from pollen-driven allergy. In some dogs with atopic dermatitis (AD), food allergens trigger their disease, which is referred to as food-induced AD. Predisposed breeds include West Highland terriers, boxers, Rhodesian ridgebacks, pugs, and German shepherds. One study indicated atopic dogs benefit from eating a prescription hypoallergenic diet, resulting in fewer flare-ups than another group of atopic dogs allowed to eat a regular OTC diet.13 It is for this reason—along with the fact veterinary therapeutic diets often have more stringent quality control than OTC diets14—that veterinary dermatologists recommend an owner feed their atopic dog a prescription hypoallergenic diet. 1 Verlinden A, et al. Food allergy in dogs and cats: a review. Critical Review in Food Science and Nutrition. 2006;46(3), 259-73. 2 Denis S, Paradis M. Diagnosis and management of food allergies in dogs and cats. Med Vet Quebec. 1994;24;11. 3 Vroom M, Biourge V. Diagnosis of adverse reactions to food in dogs: efficacy of a soy-isolate hydrolysate-based diet. The Journal of Nutrition 2004;134(8), 2062S-2064S. 4 Tsakok T, et al. Does atopic dermatitis cause food allergy? A systematic review. Journal of Allergy and Clinical Immunology. 2016;137(4), 1071-1078. 5 Rosser EJ, Diagnosis of food allergy in dogs. JAVMA 1993;203(2); 259-262. 6 Carlotti D, et al. Food allergy in dogs and cats. A review and report of 43 cases. Veterinary Dermatology 1990;1(2), 55-62. 7 Jeffers JG. Diagnostic testing of dogs for food hypersensitivity. JAVMA 1998;198(2), 245-250. 8 Mueller R, et al. Evaluation of patch testing with single protein, single carbohydrates and commercial foods. Veterinary Dermatology 2017;28(5), 473-E109. 9 Stockman J, et al. Evaluation of recipes for home-prepared maintenance diets for dogs. JAVMA 2013;242(11), 1500-1505. 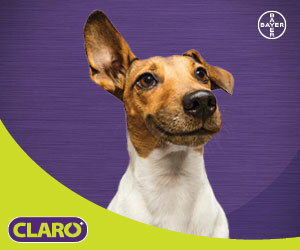 10 Raditic D, ELISA testing for common food allergens in four dry dog foods used in dietary elimination trials. J An Physiol An Nutrition 2011; 95(1), 90-97. 11 Bizikova P, Olivry T. A random double-blinded crossover trial testing two hydrolyzed poultry diets in dogs with chicken allergy. Veterinary Dermatology 2016, 27 (4) 289-e70. 12 Bizikova P, Olivry T. A random double-blinded crossover trial testing two hydrolyzed poultry diets in dogs with chicken allergy. Veterinary Dermatology 2016, 27 (4) 289-e70. 13 Glos K, et al. The efficacy of commercially available veterinary diets recommended for dogs with atopic dermatitis. Veterinary Dermatology 2008, 19(5), 280-287. 14 Raditic D, Bartges J. Nutritionist’s view: Over-the-counter versus therapeutic veterinary diets. Today’s Veterinary Practice 2017, May/June, 79-83. Alice Jeromin, RPH, DVM, DACVD, is practice owner of Veterinary Allergy & Dermatology Inc., in Richfield, Ohio. She graduated from the University of Toledo with a B.Sc. in pharmacy and worked as a hospital pharmacist before earning a DVM degree at Ohio State University College of Veterinary Medicine. Dr. Jeromin is a board-certified veterinary dermatologist, adjunct professor at Case Western Reserve University College of Medicine, past president of the Cleveland Academy of Veterinary Medicine, and a member of the American Veterinary Medical Association Council on Biologics and Therapeutic Agents. She continues to teach and lecture, and lives with her husband (a pharmacist), six rescued cats, and two elderly golden retrievers. Jeromin can be reached via e-mail at ajeromin@purrfectpet.com.